Herb Meyers and Richard Gerstman, Editors. Creativity: Unconventional Wisdom from 20 Accomplished Minds. Palgrave, 2007. This book contains the individual stories of 20 accomplished people, including entrepreneurs, designers, authors, sculptors and architects who reveal their personal histories, their inspirations and their ideas about creativity. Among the people are profiled are Nandan Nilekani, CEO of Infosys, a company of over 66,000 employees headquartered in Bangalore, India, which pioneered the concept of outsourcing services to corporations worldwide. Nilekani defined business creativity as the ability to see a pattern of potential opportunity among a number of seemingly unconnected things and visualizing a future that others do not see. For Infosys, those disparate elements included changes in the Indian economy, development of technology that permitted people in India to work for clients in the United States and greater freedom in Indian capital markets. Book Review: What were they thinking? Pfeffer, Jeffrey. What were they thinking? : unconventional wisdom about management. Harvard Business School Press, 2007. Why do companies that are led by intelligent and dedicated people make so many mistakes? Stanford professor Jeffrey Pfeffer shows that executives often make decisions that have unintended consequences, because employees and customers respond in ways that make the situation worse for the company. As an example, relying on incentive pay is usually harmful to the company in the long run. And extracting wage concessions from labor is counterproductive. Companies also make mistakes by using simplistic models of people and organizations that are not realistic, which leads them to make bad decisions. And companies overcomplicate straightforward choices when sometimes the answer is obvious. In 28 short and engaging chapters selected from the author’s column in Business 2.0, this book presents critical topics on leadership, organizational strategy and public policy. Numerous examples, data and insights challenge conventional beliefs and accepted management wisdom. Hamel, Gary. The future of management. Harvard Business School Press, 2007. Beginning with the premise that long term business success is fueled by management innovation — new ways of mobilizing talent, allocating resources and building strategies — this book is about changing the current management model based on control and efficiency. Author and consultant Gary Hamel describes a need for bold new management principles. When these principles are applied systemically throughout an organization and are part of an ongoing program of progress, they convey a competitive advantage. Using these principles, the author shows how to build a company that is continually renewing itself, how to make innovation everyone’s job and how to create a company where everyone gives their best. Using examples from Whole Foods and Google, the author shows how his principles of management innovation operate in real time. He also discusses how established companies like General Electric, Procter & Gamble, and Whirlpool have reengineered their management processes. China Road is a travelogue about a journey across China, from Shanghai to the outer most reaches of the country, to the border with Kazakhstan, a journey of three thousand miles. 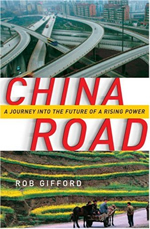 Author Rob Gifford is a reporter with National Public Radio with extensive experience working and living in China. He travels along Route 312, the Chinese Mother Road, stopping at cities and towns along the way, interviewing Old Hundred Names, the common people, the regular Joes, about their lives and what it means to live in China’s heartland today. The book begins in Shanghai, China’s most modern city. The urban economy is booming and for professionals there, life is good. There is no question that the future is even brighter. But China is a huge country and as he leaves Shanghai and travels west, Gifford finds a growing gap between urban rich and rural poor. He speaks to migrant workers, impoverished peasants, prostitutes, truck drivers, Tibetan monks, and even a hermit. He finds that the old cradle to grave provision by the state has collapsed, leaving many people worse off than before. For them, life is “Ren chi ren,” or “Man eat man.”. Gifford skillfully interweaves both humor and history throughout his story, making China Road an informative book and a very entertaining read. His observations are insightful and personal, yet the book also presents many strategic and political issues that effect China’s economic development. China Road is available at Ford Library in both Print or Audiobook format.